I love canning. There, I admitted it. The feeling of opening jars of homemade goodness during the cold winter months is unparalleled. So today, let’s talk about how to can dry beans. Pressure Canner (I like this one) You MUST use a pressure canner for beans or any other low acid food! A water bath canner simply does not get hot enough to kill botulism! 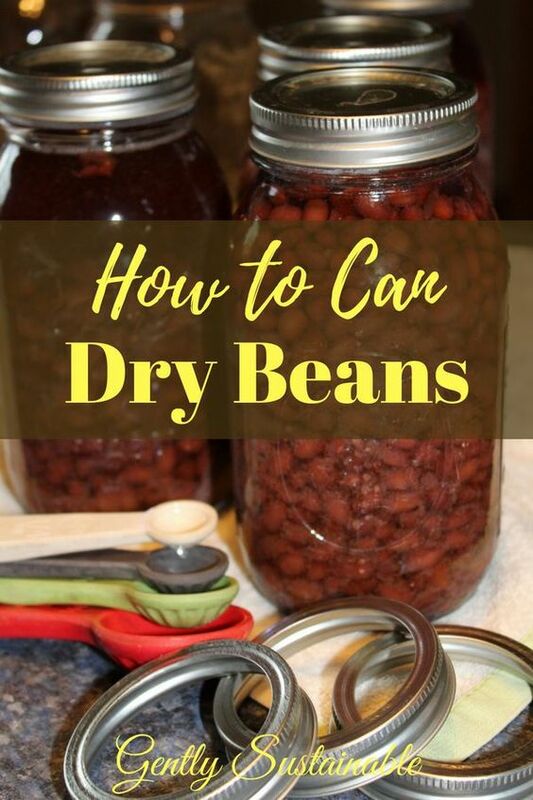 You can grow your own kidney, navy or pinto beans, which is always the cheapest way to can and preserve food. However, this time I just purchased dry beans from the store, black and pinto beans. Considering how well my canned beans turned out, I’m considering adding dried beans to my garden next year! First, you’re going to want to rinse your beans real well, and look for any little impurities to discard. 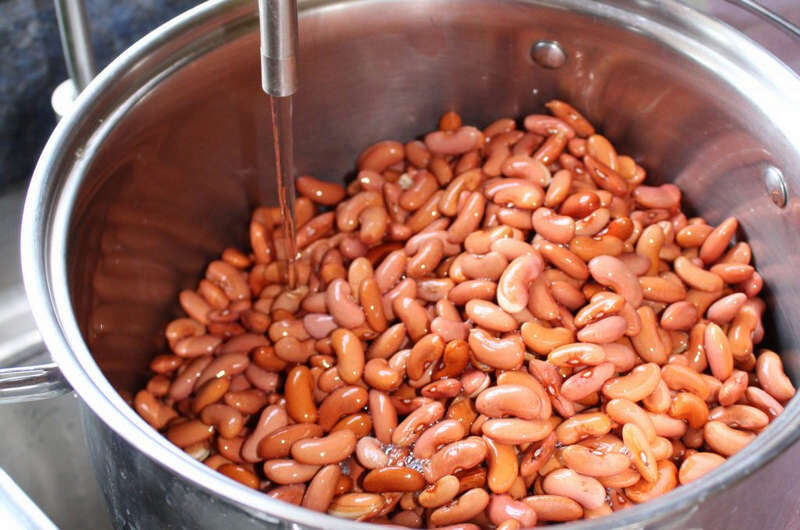 Cover your beans with water in a pot or large bowl and let soak overnight. 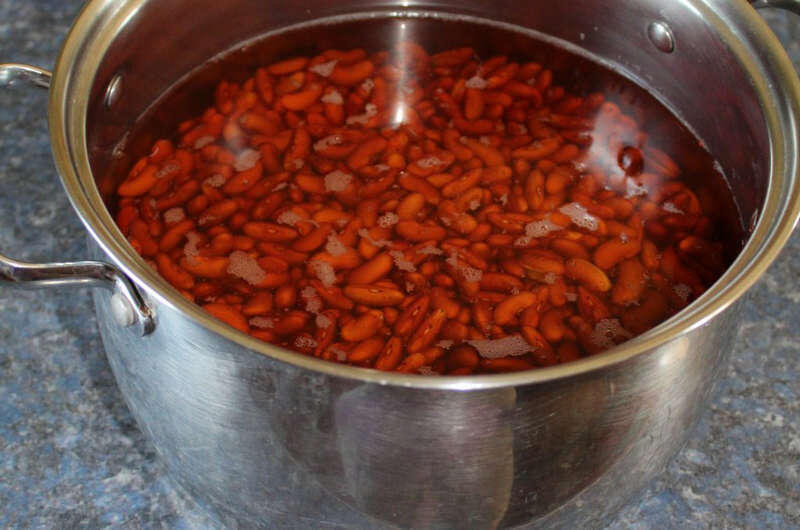 After at least 12 hours of soaking, rinse your beans real well in the sink. 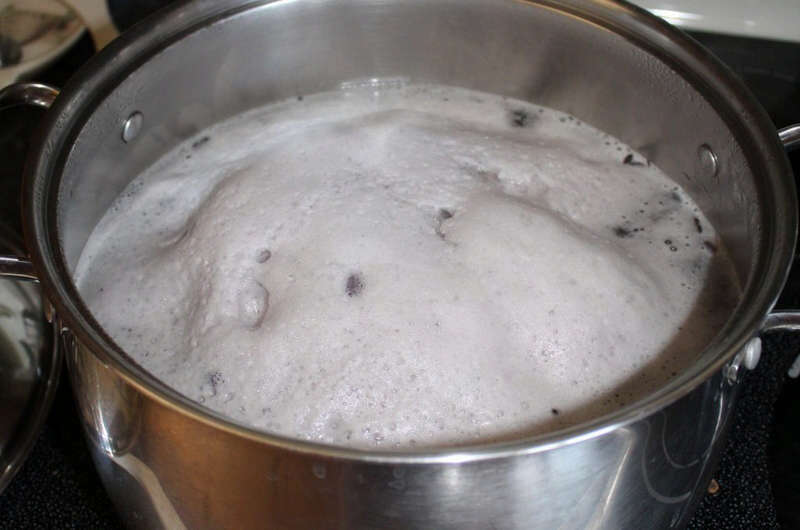 Put your beans in a pot with fresh water to cover 2 inches, and boil for 30 minutes. Stir frequently and keep an eye on, so that they don’t boil over. While you wait for your beans to boil, you can be getting your jars washed and sterilized. Also, put your lids in a sauce pot on low/medium heat, do not boil the lids. They simply need to be hot, not boiled. Once your beans are ready, pack the hot beans into your jars leaving one inch of head space. Add 1/2 teaspoon of salt for pints, 1 teaspoon for quarts. Remove any air bubbles and then wipe your rims with a clean, slightly wet cloth. Then put lids and rings on. See how fast this goes?? Love it. Read your canner’s directions, but my canner calls for 3″ of water in the bottom. 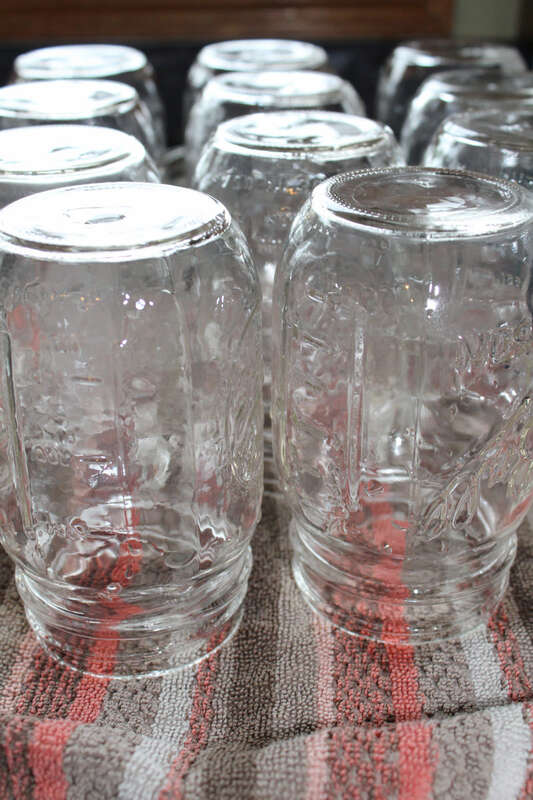 After the water, then place your bean-filled jars in the bottom of the pressure canner, leaving space between the jars as well as space from the inner wall of the canner. My canner holds 5 quarts at a time. Here’s where people get scared with pressure canners. Let me tell you….if you inspect your seal, and it’s in good shape (not dry or cracked) and you follow the directions, your chances of that pressure canner exploding, or anything else crazy like that, is minimal. Very minimal. If you are apprehensive about using a pressure canner, call someone to walk you through it. I’ve done this many times for friends and I’m super glad to do it because I want people to can! Folks tend to avoid things that they’re afraid of, so let’s get comfortable with this wonderful kitchen tool, ok?? Put the lid securely, and turn the heat on high. We are building up pressure in the canner. Stay close to the canner. This little valve is what you’re going to be paying attention to now. Once enough pressure has built up in the canner, this little value will pop. Once this happens, you need to put the little weight on the top of your canner. Keeping the heat on high, we are still building the pressure we need to can the beans. When the weight begins to “jiggle”, enough pressure has been built up. Turn your timer on at this point. Process quarts for 1 hour and 30 minutes, pints for one hour and 15 minutes. Now is when I turn the heat back a little, from 10 on my stove to about 8. I listen to my “jiggling” weight closely throughout the canning process, it’s important to stay close to your work. If the “jiggling” sounds more like “hissing”, there’s too much pressure in the canner. I would turn it down a smidgen more, to about 7.5 on my dial, until it sounds more like “jiggling” again. You want to hear a consistent “jiggling” sound throughout the canning process. With some experience, you’ll get used to the sounds of your pressure canner. Finally, your timer goes off! Carefully, slide your canner off the burner and let it rest. Do not touch the weight at this point! Turn off your burner and wait for the valve to drop, this could take a while. Once the valve drops, I remove the weight to release the rest of the pressure. You’ll hear some hissing, don’t panic! Once all of the pressure is removed from the valves, you can carefully open your canner, always pointing the lid away from you! There will still be hot steam. I like to put a clean kitchen towel on the counter, then carefully lift the jars out of the canner and onto the towel to cool down. Listen for each lid to “ping” as it seals and smile to yourself knowing that you’ve just canned your own beans! Do you recommend canning with an electric pressure cooker? I have a ceramic stove top and it’s not recommended to use a pressure cooker because of the weight. Hi Lana! I’ve never used an electric pressure cooker, so I can’t speak to that. However, I have canned on my glass top stove for many years now without any problem! I’m just careful not to slam the canner, but again, never a problem. Thanks so much for reading! Why do you want to cook your dried beans when they will store nicely as they are? Hi Sandy! I like to can beans to avoid the soaking and cooking, which I just don’t have the patience for! I like to just dump them already cooked right into my pot and move on with dinner. It’s a personal preference, but I am just offering another option for them. Thanks for reading!